GearGuyd > Home > Sockeye it to Me – Wild Alaskan Salmon Season Begins! Over here on the east coast, the first wild Alaskan salmon catch of the year has arrived! Copper River Alaskan Sockeye Salmon first hit the fish counter at my local supermarket (Wegmans) last weekend, and we’ve already had a taste. If you enjoy salmon, you MUST find a way to try some wild Alaskan salmon. It is far more flavorful and tasty than farmed salmon, and it’s probably healthier as well. It does cost quite a bit more, though – the first fillets of the season were priced at $25 per pound. If you cannot find wild Alaskan salmon locally, there are places you can order it from online. I haven’t done this yet, but might give it a try later in the season. 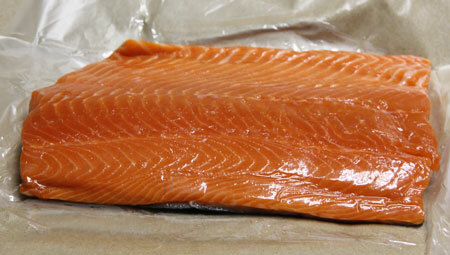 I had some fresh Copper River Alaskan sockeye salmon this weekend here in Kansas City – delicious! May I ask how you prepared it? We usually sprinkle our salmon with cajun seasoning, apply a dab of grape seed oil to prevent charring, and pop it into the oven under the broiler setting. Skin side-up for 7-8 minutes, flesh-up for 6-8 minutes, and it’s done. A little extra virgin olive oil, salt and cracked pepper, and then in the broiler similar to your cook times. Mmmm, I’m hungry for some more! I might have to try it your way one time, maybe this weekend! I have a jar of sea salt and peppercorns just waiting to be crushed.